later in the 1970's became known as Greenhead Barrowfield Church. London Road looking NW towards Glasgow Cross. The first street on the left is Anson Street. 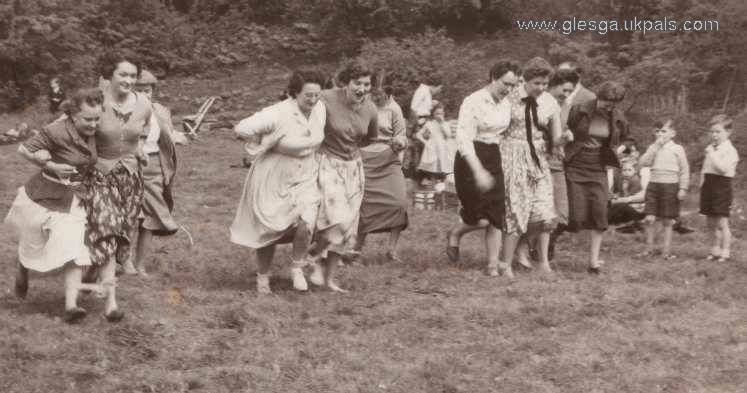 Sunday school teachers in a two-legged race, circa 1957, at a Sunday School outing to Balloch. Bessie Holmes, ? Margaret Wilson (Greenhead Street) ? ? Betty Riddell ( Rutherglen), Gail Powell (London Road) and Margaret Merilees (Landressy Street). 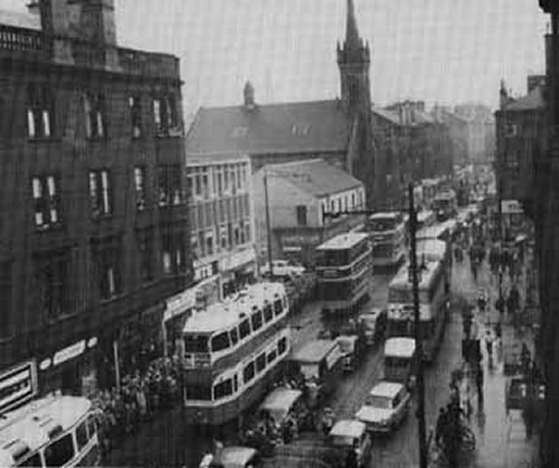 This photograph was taken by the then Church Officer, a friend of mine, Mr.Davie Thomson, who lived in Dale Street, then moved round the corner to London Rd. Davie and his wife Cathie continued their Church officer duties when the church closed and amalgamated with Calton New Parish Church in Bain Square. April 2004, Extract from e-mail Jeannie Cameron, GlescaPal, Ontario, Canada. "Webmaister, the sunday school teachers in a two legged race..... the first lady at the left of the picture is my friends sister Bessie Holmes her and Johnny were married in 1953 at that church.. Johnny Holmes was a B.B officer and now lives just off Paisley Rd. ".........today a pal of mine who was originally from Forrest St, came tae ma hoose and I was showing her Wull's website, so we go intae the churches and she said Greenhead Church is where my sister was married so in we go tae that and the second picture we looked at wiz the Sunday school teachers in a three legged race and lo and behold one o the women in the picture wiz her sister, Bessie Holmes, it blew her away so off she goes hame and phones her sister who still lives in Glesga!" Its marvellous to see how the website develops every week. I've just seen this entry about Greenhead Church. I'm sure the church had marvelous and colourful murals painted by Alasdair Gray, the famous novelist, painter and social/political commentator. I'm sure when they demolished the church they were lost. I wonder if anyone has colour photographs of them. The reference to Johnny Holmes brought back many happy memories. He taught me woodwork at the YMCA in London Road for my Arts and Crafts badge in the BB. He taught BB boys from BB companies from all over Bridgeton. Johnny lived in Greenlodge Terrace beside Mr Bob Wainwright who was the 219th BB captain. Johnny was working at the design centre in St Vincent Street for years and the last I saw him he was working at the Art School. My 75 year old mother (Margaret Wilson, of Greenhead Street) was thrilled to see herself in the three-legged race at the Greenhead Parish Church Sunday School outing to Balloch. The names recorded are reviving so many memories for her. Now in Cumbernauld, she's sorting through family photos at the moment so may have submissions in the future. Awrabest!